The see-saw monthly temperatures continued in May with much cooler temperatures than the warmth we saw in April. With a very cold start to the month and only a couple days above 25°C, the final overall temperature was 0.6 degrees below average making it the coldest May since 2009. But the bigger story was that it just wouldn’t stop raining (well actually it did for a week but that didn’t seem to matter). The total of 146.2 mm was much more than the average of 82.3 m, this is a lot but not even in the top 5 for the history of measurements in the area. 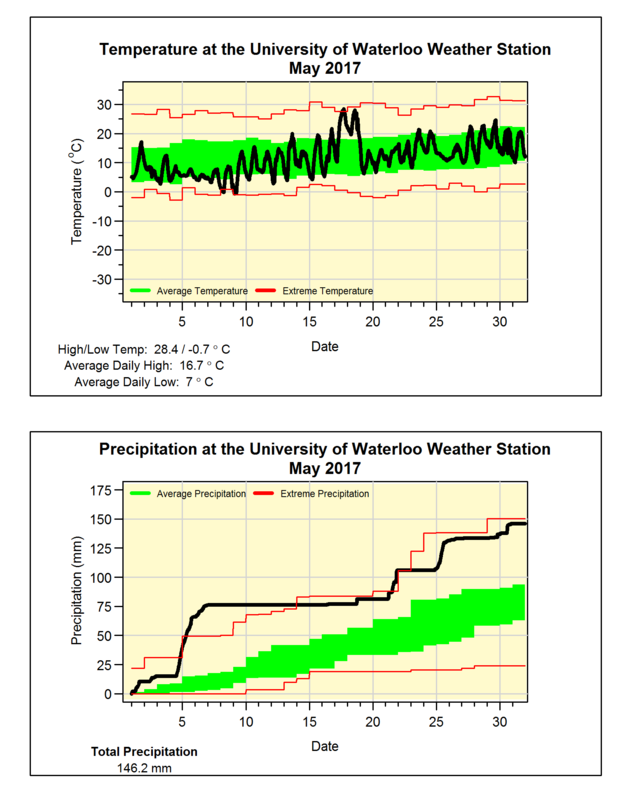 However, the total for April and May of 270.6 mm was the third highest of all time and not that much behind the record of 286.0 mm back in 1916. While the total so far for the year of 540 mm is not only well above the average of 340 mm, but is also just below the record wettest first five months of the year (541.6 mm in 2011).